These Mavic Air firmware update instructions will guide you to upgrading the quadcopter to the latest version. The firmware on the Mavic Air and remote controller can be upgraded using the DJI Assistant 2 app and also with the DJI Go 4 app. We have notes and what to do if the Mavic Air firmware update gets stuck or fails. Also included are videos on how to successfully update the Mavic Air firmware to the latest version. There have been 4 Mavic Air firmware update releases to date. Each Mavic Air firmware upgrade has added many new features and fixed issues in the quadcopter, gimbal, camera and remote controller. Some of the Mavic Air firmware updates have fixed critical issues, so it is important to upgrade to the latest firmware as soon they are released. 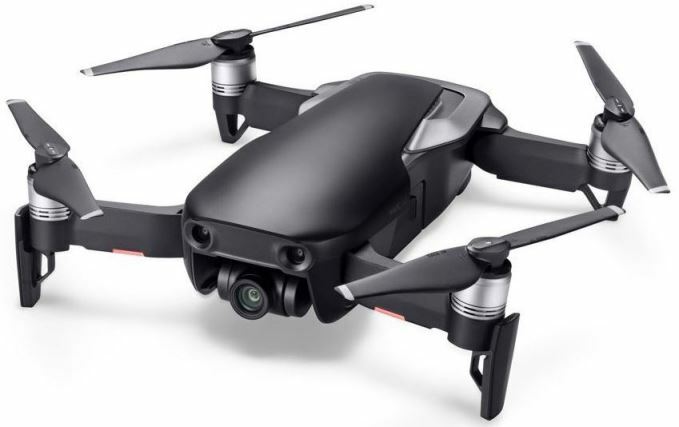 For example, the latest Mavic Air firmware version fixed an issue with the GPS in Return to Home mode, improved the flight performance and added extra stability to the camera. One of the earlier Mavic Air upgrades fixed an issue of ghosting in photos. So upgrading the Mavic Air to the latest version has so many benefits. At the bottom of this post, I have listed the many improvements, new features and bugs fixed in the various Mavic Air firmware upgrades. The release notes are very interesting reading. Here are the steps to update the Mavic Air firmware for the quadcopter and remote controller using the DJI Go 4 app. Download the latest DJI Go 4 app to your Smartphone. Remove the propellers and gimbal cover from the Mavic Air. Connect your Smartphone into the Mavic Air remote controller. Switch on your Mavic Air quadcopter and then the remote controller. Launch the DJI Go 4 app on your smartphone. A “New firmware update is available”, will show at the top of the DJI Go 4 app. 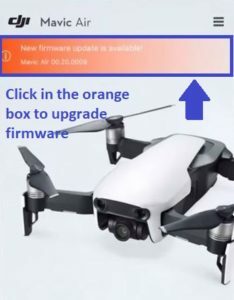 Click on the “New firmware update is available” orange box. A progress bar will show you at what stage the firmware download is at. The Mavic Air firmware update will start automatically after the download has completed. During the Mavic Air update, you will see flashing yellow and green lights on the quadcopter. When the firmware update has completed, you will receive a pop up box stating the following. Update Complete. Please manually restart your aircraft. Restart the Mavic Air quadcopter. After the restart, open the DJI Go 4 app. The update status bar will now show in green. Tap the firmware update status bar. You will now receive a “New firmware update is available”. Tap the “New firmware update is available” for the Mavic Air remote controller firmware update. After the download, the Mavic Air remote controller firmware update will start automatically. When Mavic Air remote controller update has finished, you will receive a message stating “Update Complete”. Then restart the quadcopter and remote controller to complete the Mavic Air firmware update. Here are the instructions to update the Mavic Air firmware using the DJI Assistant 2 app. The Mavic Air quadcopter battery should be at least 50% charged to do the firmware update. Download the latest DJI Assistant 2 software from DJI and install it on your laptop. With the quadcopter powered off, remove the gimbal cover and propellers. Connect the Mavic Air to a computer through the USB C-Port on the back of the quadcopter using the USB C-type cable. Power on the Mavic Air quadcopter. Select “Mavic Air” and click on the “Firmware Update” on the left panel. Click on “Upgrade” beside the latest firmware version. The firmware will start downloading showing you a progress bar. When the download is complete, the firmware update process will start automatically. During the firmware update the lights on the front of the Mavic Air will be flashing yellow. When the update has finished, you will see that the firmware update has reached 100% with a green check mark. Click on the back button and you will see that the current version is now showing the latest firmware update. Reboot the Mavic Air quadcopter after the firmware update is complete. Attach the propellers and gimbal cover. Note: If you need components for your quadcopter, then visit our Mavic Air parts, upgrades and accessories page. With the Mavic Air remote controller switched off, connect the micro USB adapter to the USB C-type cable. Plug the cable into the side of the DJI Mavic Air remote controller. Attach the other end of the cable into your laptop. Next switch on the Mavic Air remote controller. Open the DJI Assistant and the software should detect the “RC For Mavic Air”. When the update has finished, you will see on screen that the firmware update has reached 100% with a green check mark. Restart the Mavic Air remote controller. Make sure you update the DJI GO 4 app to the latest version before updating the firmware. In general, once the firmware has been updated, it cannot be downgraded to a former version. Restart the Mavic Air and remote controller after the upgrade is complete. The Mavic Air firmware update may reset various Main Controller Settings, such as the RTH Altitude and Maximum Flight Distance to factory defaults. Before the update, take note of your preferred DJI GO 4 settings and re-adjust them after the update to your preference. This firmware update will reset the camera settings. Some of the Mavic Air firmware updates will disable the GEO zone authorization, which will then need to be reinstalled. Please check the firmware release notes. If the DJI Mavic Air firmware update gets stuck or fails, then try the following. At what point is the firmware failing. If the firmware is not downloading, then more than likely the problem is with your connection to the internet. Check your WiFi or try another internet connection. Power off the Mavic Air quadcopter, remote controller and your smartphone. Charge the batteries on the quadcopter, Remote Controller and your smartphone to full power. If you are doing the Mavic Air firmware upgrade using the DJI Go 4 app on your smartphone, then check the performance on your smartphone. Go into Settings and Device Maintenance and improve it’s performance by shutting down background apps and turn off notifications which are using up memory and storage. 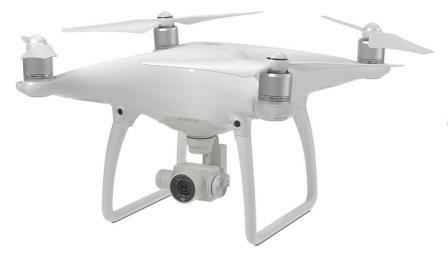 Other apps on your smartphone could be updating as the same time as you are updating the quadcopter. Also switch off notifications which could be interfering with the upgrade process. Download the firmware version file again. Make sure you have downloaded the correct Windows or Apple version for your device. Then try updating the firmware again. If the update fails using the DJI Go 4 app, then try the Mavic Air firmware update using the DJI Assistant 2. If the Mavic Air firmware update is failing using the DJI Assistant 2 app, then check the cable is correctly connected between the laptop and quadcopter. Also, try a different USB C-type cable. Listed below are the Mavic Air firmware versions released to date. It is very interesting to read about the new features, which have been added in the Mavic Air updates. It is also extremely interesting to see the bugs and issues, which were also resolved by updating the Mavic software. Added support for using the DJI Goggles Head Tracking Flight feature on the remote controller. Shortened time taken to power on the remote controller. Changed default control stick deadband settings on Mavic Air remote controller. Fixed an issue that occasionally caused linking to fail between Mavic Air quadcopter and remote controller. Optimized the Advanced Pilot Assistance Systems performance. Added Boomerang and Asteroid for QuickShot. Added support for DJI Goggles (requires DJI Goggles firmware v01.01.0200 or above). Shortened time taken to recognize propeller guards. Increased maximum ascent speed to 4 m/s and maximum descent speed to 3 m/s in Sport mode. Improved flight stability and obstacle detection. Improved subject recognition accuracy in Intelligent Flight Modes.